“Come Up and See Me Sometime.” Words by Arthur Swanstrom, music by Louis Alter; composed for the motion picture Take a Chance (1933). Recorded by Elsie Carlisle with orchestral accompaniment in London on November 8, 1933. Decca F. 3737 mx. GB6297-2. “Come Up and See Me Sometime” was written by Arthur Swanstrom and Louis Alter for Paramount’s 1933 musical comedy Take a Chance, based on the stage play of the same name. The movie apparently inherited little from the play other than a couple of songs, but it augmented what it did borrow with other, more memorable songs, including the perennial “It’s Only a Paper Moon.” “Come Up and See Me Sometime” is introduced by actress Lillian Roth, who sings it while performing a burlesque act. The title of the song presumably derives from a suggestive catchphrase of Mae West’s, which originally took the form “Why don’t you come up sometime and see me?” (in She Done Him Wrong ), but which soon became the rhythmically preferable “Come up and see me sometime” (as it occurs in I’m No Angel ). Elsie Carlisle dishes out boldness in her version. The visual component of the movie’s burlesque scene is absent, but Elsie leaves no doubt as to the import of the song’s repetitive sultry invitations to get to know her better. As the song progresses, her intonation increasingly approaches that of the vamp, and her final “…any ti-i-i-IME!” finishes our impression of the self-consciously predatory showgirl. 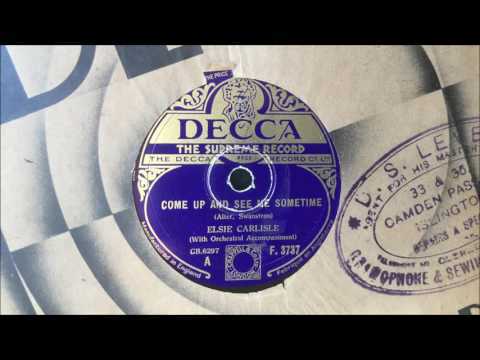 “Come Up and See Me Sometime” was recorded in America in 1933 by Ramona Davies (on vocals and piano) and Cliff Edwards (a.k.a. Ukulele Ike). In March 1934 two versions were recorded by Ethel Waters. 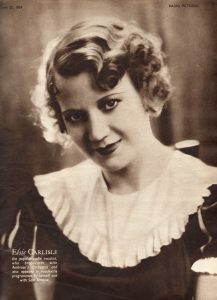 In Britain in 1933 there were also recordings of “Come Up and See Me Sometime” by The BBC Dance Orchestra (directed by Henry Hall, with vocalist Phyllis Robins, in a striking Phil Cardew arrangement), Scott Wood and His Orchestra (with vocals by Sam Browne), the Casani Club Orchestra (directed by Charlie Kunz, with vocalist Cecile Petrie; the recording was never issued), and Joe Loss and His Band (with singer Annette Keith). A great song , sang superbly by Elsie .It’s easy to see how she became so successful with such talent !